On a recent weekend in Budapest, I set out to explore some of the city’s more weird and offbeat offerings. Among them was a statue of Ronald Reagan. The first thing I thought when I saw the statue was “Just how did a Ronald Reagan statue get here?” I did a slew of research and it turns out Hungarians are bigs fans of the former American president. Located in Budapest’s Liberty Square, there’s a (literally) larger than life statue honoring America’s 40th president, Ronald Reagan. Even though he never visited Budapest during his presidency, Hungarians appreciate his efforts to help end the Cold War and Russia’s control over the country. Just a few months after President Reagan left office in January 1989, Communism began to rapidly collapse across Europe (imagine that we once lived in a world where American presidents opposed Russian oppression). 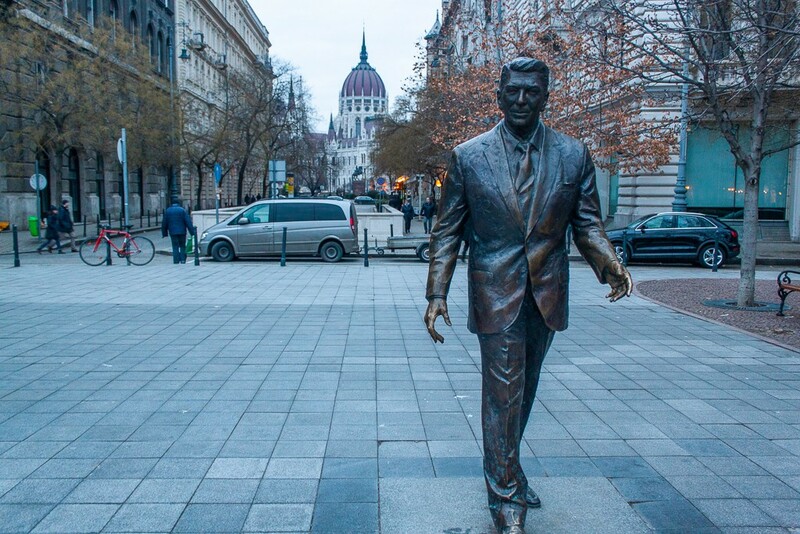 Recommended reading: In Honor Of His 100th, Ronald Reagan To Get Statues In Budapest, London, Statue in Budapest’s Liberty Square credits Reagan for freedom, & Ronald Reagan Statue Unveiled in Budapest. 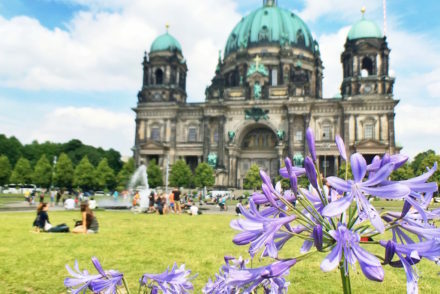 The statue was unveiled in June of 2011, where hundreds of people gathered to celebrate the momentous occasion including then U.S. Secretary of State, Condoleezza Rice, and Hungarian Prime Minister, Viktor Orbán. During the ceremony Orbán said: “Today, we are erecting here a statue to the man, to the leader, who changed, who renewed, this world and created in it a new world for us in Central Europe – a man who believed in freedom, who believed in the moral strength of freed people and that walls that stand in the way of freedom can be brought down.” Certainly, a rich remark coming from someone who built border fences around his country during the refugee crisis in 2015. Recommended reading: The square where Regan currently stands is full of sordid, if interesting, history. Curious to know more? Than do yourself a favour and read, Ronald Reagan and Other Hungarian Heroes. 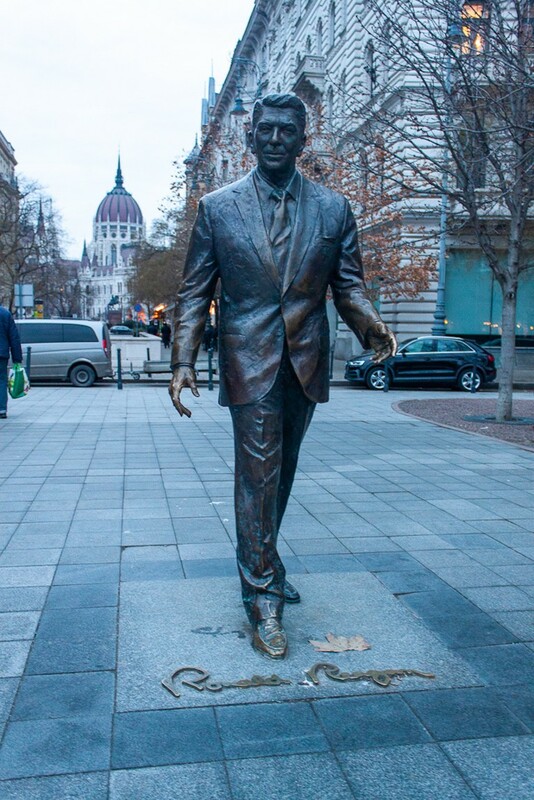 Hungarians are so taken by the President that this is actually the second statue of Reagan in Budapest – there’s a bust of him in one of the city’s parks. This newer bronze statue, designed by sculptor Istvan Mate, is 2 or so meters high, rests on a block of granite, and shows the man walking mid-stride. Reagan’s likeness not only faces the American Embassy but even more boldly, a monument paying tribute to the Red Army’s fallen comrades during WW2. The imposing Hungarian Parliament Building also looms largely in the background behind the President. Without any supporting statistical data, a Tripadvisor reviewer surmised that there are more than 1,000 photos taken with President Reagan each day. Not wanting to be one of those boring people who didn’t pose with the statue, I also took an obligatory photo which I spread around on social media with the brilliant caption – “Improving US and Canadian relations”. 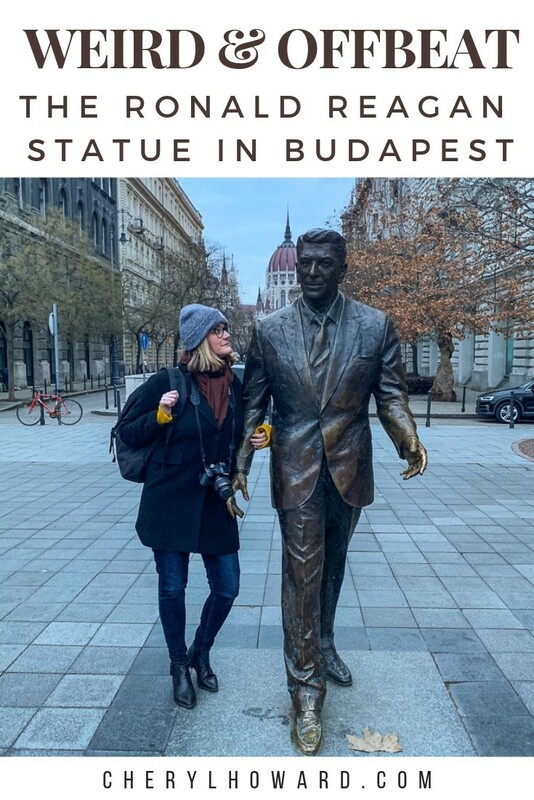 If you’re a fan of this Ronald Reagan statue and you want to find other tributes of him around the world, visit Prague to walk along the street named after him or visit London to check out yet another statue of him. What other weird and offbeat attractions can you recommend in Budapest? Let us know in the comments below. 1) Seeing the statue is free, as it’s open to the public 24/7. Or check out these things to do in Budapest. 4) If you want to read an unflattering article about a certain orange faced American president, then give this a read: Weird & Offbeat: Putin and Trump Shotgun Street Art in Vilnius. 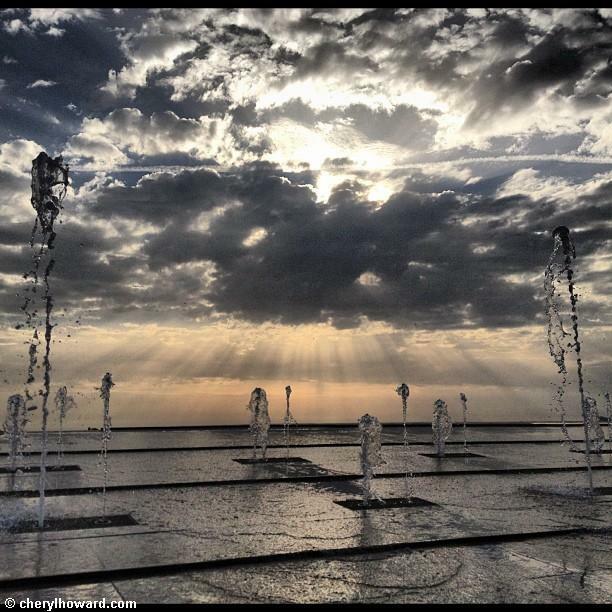 5) Want to discover even more of Budapest? Book a city tour now. 6) Need somewhere to stay when you’re in Budapest? Check out hotel offerings on booking.com. 7) If you like road trips, why not rent a car while you’re in Hungary? 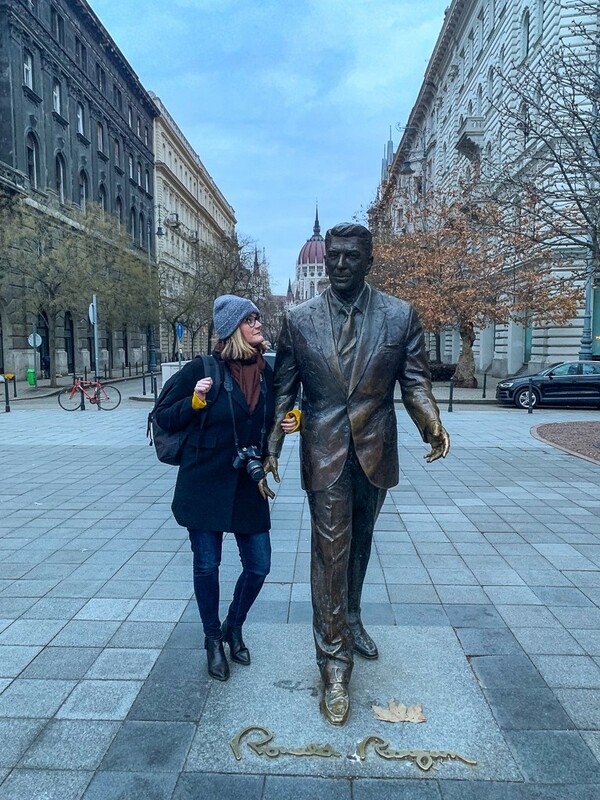 8) When travelling in Budapest, you’ll find that most bars, restaurants, and hotels offer free wifi so you can keep posting good finds like this Ronald Reagan statue to your Instastories or look up where you’re going next with Google Maps. Stay safe and consider using a VPN to protect and encrypt your personal data. *Disclosure – This post was done in collaboration with BestVPN.com. The post also contains some affiliate links. If you book a tour, car rental, or hotel through any of these links, I’ll earn a tiny commission at no extra cost to you. Thanks for your support! 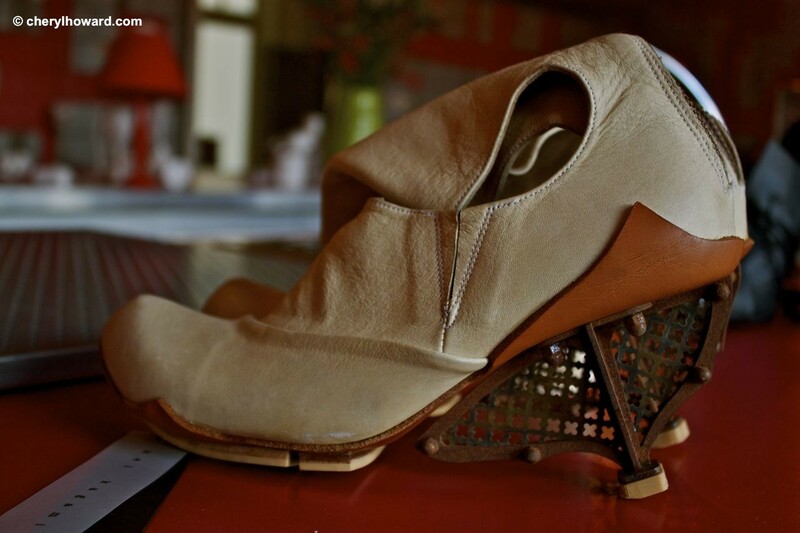 A Kei Kegami Restrospective At The Lloyd Hotel, Amsterdam.